John C. Bogle, who died on January 16, 2019 at the age of 89, was hardly universally well liked within the investment community. Visionary leaders who disrupt comfortable industries rarely escape the ire of those who have been displaced. On the other hand, Mr. Bogle was a hero to millions of investors at The Vanguard Group, the investment company he founded in 1975, as well as to the broader community of cost-conscious individual investors known as “Bogleheads“. Through Mr. Bogle’s tireless efforts to lower the cost of investing, investors have saved billions of dollars that would have otherwise gone to various “helpers” in the investment community. 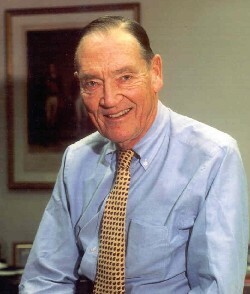 If a statue is ever erected to honor the person who has done the most for American investors, the hands- down choice should be Jack Bogle. For decades, Jack has urged investors to invest in ultra-low-cost index funds. In his crusade, he amassed only a tiny percentage of the wealth that has typically flowed to managers who have promised their investors large rewards while delivering them nothing – or, as in our bet, less than nothing – of added value. In his early years, Jack was frequently mocked by the investment-management industry. Today, however, he has the satisfaction of knowing that he helped millions of investors realize far better returns on their savings than they otherwise would have earned. He is a hero to them and to me. Mr. Bogle’s crowning achievement was the invention and proliferation of low cost index funds that are designed to simply match the investment results of unmanaged indexes such as the S&P 500. These funds do not attempt to beat the market through selection of securities or timing the movement of funds based on macroeconomic factors. In exchange for giving up the prospect of beating the market, investors gain the certainty of knowing that they will at least match the market prior to investment costs. And due to the lack of a need to hire active managers and to Vanguard’s investor-owned fund structure, costs are vanishingly small. Today, the expense ratio of the Vanguard S&P 500 Index Fund (Admiral Shares) is a mere four basis points, or 0.04%, meaning that one only pays $4 annually for every $10,000 invested in the fund. In contrast, the famous Fidelity Magellan Fund, which is actively managed, has an expense ratio of 0.69%, or $69 annually for every $10,000 invested in the fund. Over the decades, the expense ratio of Vanguard’s funds have dropped due to increasing scale and this has pressured the expense ratios prevailing throughout the mutual fund industry. Mr. Bogle also did away with fund loads, or sales charges, early in Vanguard’s history. These sales loads, which were often up to 7 percent of assets invested in a fund, have become much less common in the mutual fund industry. Between lower expense ratios and the decline of sales loads, no wonder Mr. Bogle’s popularity within the investment community wasn’t universal! Much has been written regarding Mr. Bogle’s legacy with a focus on the massive sums he has saved for individual investors. 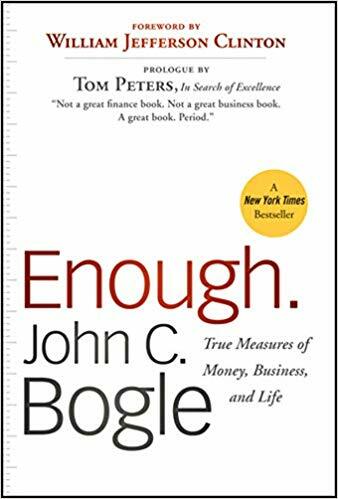 However, anyone who has read Mr. Bogle’s book, Enough: True Measures of Money, Business, and Life, realizes that cost savings were only one part of his overall philosophy toward business and life. One chapter of the book is entitled “Too Much Business Conduct, Not Enough Professional Conduct“. The distinction between professional conduct and business conduct may seem confusing to many people, at a surface level. After all, in our free enterprise system, isn’t a profession simply one of many means to the end when it comes to achieving business success? Take a step back from thinking about finance, narrowly defined, and consider the field of medicine. A doctor goes through many years of education and residency prior to achieving meaningful income potential. This seems like a classic investment calculation: The prospective medical student compares the cost of his or her education (and the opportunity cost of many years of foregone wages in some other field) to the lucrative riches that can be expected once established as a fully trained physician. If the present value of the expected income earned as a doctor exceeds the costs of the education, then become a doctor. If not, enter some other more lucrative field. But does anyone really believe that this is how a prospective medical student thinks about his or her decision to become a doctor? Of course not. The decision to enter medicine has an economic component, but it also has many completely non-economic factors. Although encounters with jaded doctors who have been in practice for many years may obscure this truth, the reality is that the vast majority of doctors almost certainly enter the field in order to help patients and save lives! They are entering a profession and a calling, not merely seeking to maximize their economic outcome. Mr. Bogle believed that the same fundamental professionalism should exist in the field of investment management. But should it? After all, those of us who are in the investment industry aren’t here to save lives, are we? We are here to make money. So we should maximize our economic outcomes at all costs, right? Mr. Bogle would have completely disagreed with that all-too-common sentiment, as his book makes crystal clear. Investment professionals are agents acting on behalf of owners of capital. Looking at the numbers, one can easily forget that these owners include millions of ordinary individuals who are saving for various life goals such as sending their children to college, purchasing a home, and funding retirement. Looking after the financial health of individuals should be viewed as a calling, as a profession, and not merely as a business. In our consumer driven culture, wealth is often thought of as the ability to purchase goods and services, and this is obviously one use of money. However, what money really represents is financial freedom and independence. Money can buy control over the one thing we all have a limited supply of: Time. Poor returns, whether driven by bad investment choices or high costs, shows up as a lower balance on account statements, but the real effect is that financial freedom is deferred for those who are affected. There are very real consequences for those who have to defer retirement or find that their activities in retirement are highly constrained. There are some things that one simply doesn’t do. Everyone else is doing it, so I can do it, too. Our society cannot and should not tolerate the substitution of moral relativism for a certain form of moral absolutism, and its debasement in the ethical standards of commerce. Mr. Bogle was a wealthy man but he left billions of dollars on the table compared to other founders of large financial institutions. It does not seem like this bothered him very much, although he does acknowledge that he did not have any premonition regarding the massive wealth he was giving up by creating Vanguard’s structure. He comes across as a man who had more than enough in terms of financial wealth and was highly satisfied with the fulfillment of his professional calling.